Monday Maul looks back at a weekend where Northampton and Bath separated themselves from the rest of the pack while more players saw red in a dubious call. "He is a great character to have around. The improvement he has made is huge." That was flanker Calum Clark's assessment of Manoa in the wake of Northampton's win over Harlequins at Twickenham, a match where the USA No.8 collected yet another Man of the Match gong to add to his overflowing mantelpiece of accolades. Manoa is perhaps the finest No.8 playing the game in the northern hemisphere yet next year he will have swapped his cosy Franklin's Gardens surroundings, a place where his star shines brighter than most, for the Galactico-filled Stade Felix Mayol in Toulon. Manoa was offered an unparalleled four-year deal by supremo Mourad Boudjellal - the first such contract of his time in charge of Toulon - and it is easy to see why. As a No.8, Manoa has it all yet he can also cover the second-row with aplomb and fit in at blindside. He will be sorely missed at the Saints, you can count the like-for-like replacements for Manoa on the fingers of one hand yet you doubt Kieran Read will be coming north after the World Cup and Bath are getting ever-closer to signing Duane Vermeulen. Manoa's absence will be felt at the Saints. He has improved immeasurably since he joined Northampton in 2011 and he owes them a great debt. 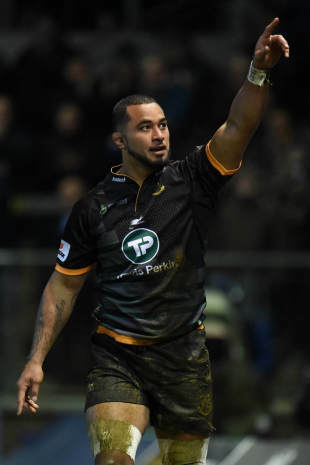 But the Saints also owe much to Manoa and he will go down in green and yellow folklore as one of the key protagonists in their charge to the Premiership title last term. Jim Mallinder now faces the unenviable task of trying to replace Manoa and he could do well to take a leaf out of Oakland A's Billy Beane's book. He saw that when you lose a key player and are struggling to find someone who can offer the same, then you sign two players who can make up one. For those who take pleasure in the fire and brimstone side of rugby, namely the forwards, they would have relished in Bath's third try against the Exeter Chiefs on Saturday. It was a score which saw Bath drive Exeter 30 metres back after stealing their lineout to leave Dave Attwood holding the ball as the pack rumbled over the Chiefs' line. It was a hark back to the John Connolly days at the Rec where the backs were left to do little more than shuffle their feet in some dark recess of the Bath pitch while the likes of Zac Feau'nati and Danny Grewcock went about their business. But this is a new Bath, one that is focused just as much on the attacking virtuosity of their backs as the manoeuvrability of their forwards. Bath played with a wonderful abandon against Exeter with penalties tapped on their own 22 while Anthony Watson, Kyle Eastmond and Jonathan Joseph looked for offloads or gaps rather than putting boot to ball. Such was their fluidity there is a school of thought that perhaps Stuart Lancaster could do a lot worse than unleash the Bath 10, 12, 13 combination of George Ford, Eastmond and Joseph for their Six Nations opener against Wales. There would be no need to bed them in and fine-tune their telepathic connection though Eastmond gave such a possibility the proverbial straight bat in the wake of their triumph on Saturday. "That's not for me to decide," he told the Independent on Sunday. 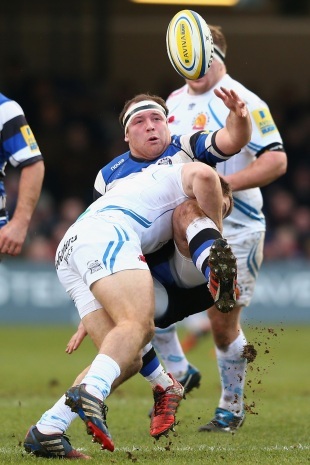 "I am here to play the best I can when I'm given the opportunity, whether it's for Bath or anyone else. It's good that Bath allow me to play my natural game. I'm a ball-playing rugby player. I'm not a runner, I like to play with the ball in hand. George knows when I want the ball and when I don't. It does help when you've got a forward pack like we've got." "We may be two years ahead of the plan" was Dean Richards' view on where Newcastle are in the wake of their narrow defeat at home to Saracens. Sarries boss Mark McCall also laid praise at the Falcons' door describing them as the "most improved side in the Premiership". Though the Falcons were left with one point for all their efforts against Saracens, they could have had two had Juan Pablo Socino's conversion for Chris Harris' second try sailed through the posts rather than drifting past. No longer are the Falcons an easy side to face with Richards' gnarly approach to the game during his playing days now rubbing off on to his team. They are improving game-on-game and it is only a matter of time until they take one of the top side's scalps. In the battle of the Exiles, London Welsh's Tom May and Irish's Dan Leo were shown red cards for their scuffle in the first-half. It looked like May's was for an elbow on Leo while his was for the subsequent retaliation. The reaction was one of surprise from both camps and it was a similar case on the various social media platforms. Hopefully neither will result in lengthy bans as it looked like a yellow card for both would have been a fairer punishment. Tough couple of days. Thanks for the messages of support. @danleo82 & I just getting a bit over eager. Onwards & upwards. Packing out Twickenham was a remarkable effort from Harlequins and though they lost, the experience will pay dividends in the future for their younger contingent. Their back-row had one 23-year-old and another who is 21 while second-row Charlie Matthews is 23 and prop Will Collier is also 23. Running out at a packed HQ, playing against the Premiership champions and learning game-on-game will stand them in good stead in the future. It was not meant to be like this at Kingsholm this term. After a poor 2013-14 campaign where Gloucester's forwards spent more time back-peddling than grunting forward, the expensive signings in the pack and the new-look coaching team were meant to breathe new life into the Cherry and Whites. But as the calendar ticks into 2015, Gloucester are in the same position they finished last season and have lost four of their last six home Premiership games. On Sunday they fell at home to Wasps, a team who last won away in the league in March, and there is little improvement to show. Head coach Laurie Fisher went 'medieval' at half-time on Sunday but even the hairdryer treatment failed to turn the match on its head. When London Welsh's inevitable relegation back to the Championship is confirmed, the attention will shift to just who will replace them with a general hope they will prove to be more competitive. No one takes pleasure in watching the Exiles slump from defeat to defeat and you can do little more than feel for the players who have to raise themselves from the canvas week-on-week. But there will be a hope that if Worcester or Bristol gain promotion after circumnavigating the farcical play-off system then they will fare better than their predecessors. At present Worcester lead the Championship but Bristol are hot on their heels and both have an infrastructure which could cope with Premiership rugby.